I said I would do a study of sunflowers for Flowers in Art month and here they are - more about these later. When I was younger it took me an awful long time to realise just how many sunflower paintings Van Gogh painted. This post is about that and the value of repetition. I am hard at it, painting with the enthusiasm of a Marseillais eating bouillabaisse, which won't surprise you when you know that what I'm at is the painting of some big sunflowers. I have three canvases going - 1st, three huge flowers in a green vase, with a light background, a size 15 canvas; 2nd, three flowers, one gone to seed, having lost its petals, and one a bud against a royal-blue background, size 25 canvas; 3rd, twelve flowers and buds in a yellow vase (size 30 canvas). The last one is therefore light on light, and I hope it will be the best. Probably I shall not stop at that. Now that I hope to live with Gauguin in a studio of our own, I want to make decorations for the studio. Nothing but big flowers. If you click the link to the letter you can see small reproductions of the flowers to which he refers. Gauguin was very impressed by the paintings hung in his bedroom. My Van Gogh book tells me that the only picture he managed to paint during his stay in the Yellow House was "Vincent painting sunflowers". Van Gogh also drew sunflowers. In this previous post - as part of Van Gogh month in February this year - shows a drawing of a garden and a profusion of sunflowers. Read Van Gogh's letter in which he makes reference to this drawing. Sunflowers became a symbol of Van Gogh but also of the way he enjoyed to work. He started working every day at dawn because the flowers wilted quickly and he had to try and do the paintings in one go. I am now on the fourth picture of sunflowers. This fourth one is a bunch of 14 flowers, against a yellow background, like a still life of quinces and lemons that I did some time ago. Only as it is much bigger, it gives a rather singular effect, and I think that this one is painted with more simplicity than the quinces and lemons. Do you remember that one day we saw a very extraordinary Manet at the Hotel Drouot, some huge pink peonies with their green leaves against a light background? As free in the open air and as much a flower as anything could be, and yet painted in a perfectly solid impasto, and not the way Jeannin does it. That was a very sound piece of work. As for stippling and making halos and other things, I think they are real discoveries, but we must already see to it that this technique does not become a universal dogma any more than any other. That is another reason why Seurat's “Grande Jatte,” the landscapes with broad stippling by Signac and Anquetin's boat, will become in time even more personal and even more original. The colours of the sunflowers also represented the colour of the south - and the colour of the house he lived in. Interestingly he sees the house as a work of art and the sunflowers very definitely as decorative art - and a way of creating a place where painters would come to paint. it was all part of his initiative to try and weld life and art together - a concept he derived from his studies of Japanese art. However, I want to have the other room just as elegant with a walnut bedstead and a blue coverlet. And all the rest, the dressing table as well as the cupboard, in dull walnut. In this very tiny room I want to put, in the Japanese manner, at least 6 very large canvases, particularly the enormous bouquets of sunflowers. You know that the Japanese instinctively look for contrasts and eat sweet peppers, salted candy, fried ices and iced fried things. So it follows, according to the same system, that in a large room there should only be very small pictures and in a very small room one should hang very large ones. Note on Chrome Yellow: Van Gogh used to use a lot chrome yellow pigment. This pigment has developed a poor reputation because it tends to deteriorate. The Van Gogh Museum has an item on The detrioration of Chrome Yellow pigments. Note on Study of Sunflowers: My study of sunflowers is not a still life study in the conventional sense in that the flowers are not arranged like this. As with the dahlias earlier, I had four stems of sunflowers and I just kept revolving them until I got a pattern I was happy with. Each found its 'natural' position (interm of what was interesting about that stem) and then found its place on the paper. I completed the drawing in pen and ink (using my new Edding 1800 profipen 0.3 which is lightfast and has pigment ink) and then decided that it might look better with some yellow. I used the new lightfast Prismacolor 'Canary Yellow'. I also used Rembrandt Polycolour 'Lemon' and 'Light Chrome'(!) and a Faber Castell Polychromos 'Light Ochre' pencils. I must find out what pigments Lyra Rembrandt actually use for the Chrome Yellow pencil! Drawing the same subject repeatedly creates a knowledge and an ability to draw more quickly the next time, sometimes to know when it is possible to leave things out - and when to heighten certain aspects which are intrinsic to the 'being' of the object in question. Repetition is a very valuable exercise in creating art. I hope you enjoyed Flowers in Art Month. Tomorrow I start Gardens in Art month - and I'm now off to visit Sissinghurst! Flowers in Art: what's on my bookshelves? Posted by Making A Mark on Tuesday, July 31, 2007 4 comments Who's linking to this post? oil on canvas, 34" x 45"
Following on from Flowers in Art: Contemporary Painters #1, this post highlights a number of female artists who paint flowers - Geraldine Girvan, Pamela Kay, Diana Armfield, Shirley Felts, Nel Whatmore, Kim Parker and Shirley Trevena. I'd very much like to emphasise that I'm well aware that there are a number of other excellent artists in this field - and that surfing the internet can uncover lots of wonderful work - not least among contemporary artists who blog! Geraldine Girvan is a modern Scottish Colourist who paints in both oils and watercolours and who exhibits regularly at the Chris Beetles Gallery in St James, London. She trained at Edinburgh College of Art where one of her first tutors was Elizabeth Blackadder and like Blackadder she paints flowers and cats - although not in the same painting! I particularly enjoy her talent for painting complexity and the exuberance of her work. This works well whether she is painting using vibrant or more muted colours according to the season and context. As with Blackadder, her slightly quirky take on perspective at times only enhances her compositions. Do take a look at the gallery of 50 works which were exhibited at her show at the Chris Beetles Gallery in April this year to get some insight into the range of her work. Two artists who paint flowers in what I always think of as a painterly and somewhat traditional English style are Diana Armfield and Pamela Kay. Pamela Kay ARCA, RWS, NEAC, RBA is is a graduate of the Royal College of Art and is considered to be one of Britain’s foremost painters of flowers and still life. She exhibits regularly (eg NEAC, Richard Hagen - this one has good examples of her work) plus now has a prints site. She works predominantly in gouache and watercolour but also paints in oils and no matter which medium she worls in, she achieves a wonderful combination of saturated colour combined with painterly brush strokes and excellent draughtsmanship. She is particularly expert at making gouache look like oils and for many years I yearned to be able to do the same! She has written "A Personal View: Gouache", published by David & Charles. 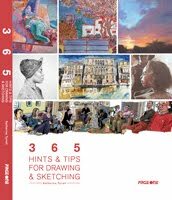 This is the ONLY book I've ever come across which sets out how to make this medium work in expert hands. Michael Spender has also written a book "The Art of Pamela Kay" (David and Charles) which highlights how her work was originally inspired by the still life paintings of the Dutch, French and Spanish masters (see Making A Mark - "What is a Still Life?"). It was certainly her paintings seen at exhibitions at the Bankside Gallery which made me go and look at the sources which stimulated the wish to develop a contemporary version. She also used to regularly win the prize for the painting most popular with the public. It would seem that the classic still life never ever goes out of favour - although artists can always bring a new interpretation with the the subjects and media of their choice. Diana Armfield RA is now in her 80s but still exhibits regularly at the Royal Academy, the Pastel Society and New English Art Club. She paints in oils and less often in watercolour. She also does lovely pastel drawings (which is how I first came across her work) and etchings. You can see her art at a number of places on the internet (eg NEAC, )although she tackles various subjects besides flowers. The Art of Diana Armfield was published in 1995 and includes many examples of her still life work. An interesting way of looking at who is producing contemporary art which enjoys wide popularity is to take look at the commercial websites which publish fine art prints of flower paintings. Two best selling UK artists who have been very popular in this respect are Nel Whatmore and Shirley Felts. Nel Whatmore has specialised in the large macro floral, initially painted in oil but subsequently licensed (to Washington Green) and now translated into all manner of decorative products. She has been very successful and her art suggests that the approach of painting large simple macro (as first exemplified by O'Keeffe) still draws the fans. You can read more about how she found success (and she exemplifies the sort of success which can be enjoyed by those offered support by the Princes' Trust) and how she approaches her painting here. By way of contrast, Shirley Felts is best known for her exquisite watercolour paintings of large and complex floral still lifes. She has terrific control over her use of watercolour and, in my opinion, has a particular gift for being able to find a palette which complements one dominant colour in each painting. I've only ever seen an original in the home of a friend but I bought her prints when I was young and they enjoyed a place on my walls for many years until my own work took over! Finally, back to a contemporary watercolourist. Shirley Trevena is a member of the Royal Institute of Watercolourists and is renowned for painting flowers in watercolour. Scroll down this page of exhibitions at the Orange Street Gallery to see the works included in a solo exhibition of her work earlier this summer. Flowers are a wonderful source of information & many of my paintings will have begun by choosing flowers that are strong in colour & dramatic in shape to give me the information I might need to complete a vibrant piece of work. A thought occurred to me as I developed this very quick and highly partial review of contemporary female artists who paint flowers. 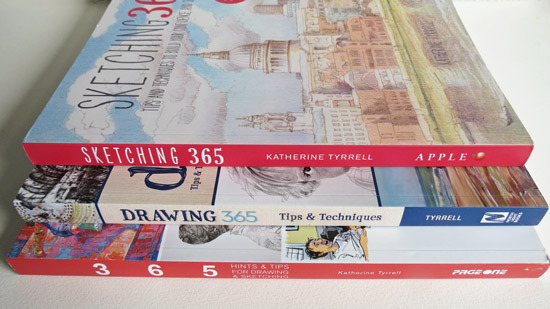 Although artists may be stimulated by the work of others through study or tuition, those who are successful are very often those who are able to interpret and create their own unique way of seeing and painting style in their own work. I also know I'm much less familiar than I'd like to be with contemporary female artists in the rest of the world who have achieved success in painting flowers. Maybe readers can suggest names of artists with similar reputations? Posted by Making A Mark on Monday, July 30, 2007 3 comments Who's linking to this post? 29th July 2007: Who's made a mark this week? oil on panel, 5" x 7"
It's gray and raining outside as I write this, as it has been for more days than I care to remember this summer. In fact the weather is emphatically 'making a mark'! For plein air painters like Rob Ibjema, the change in the jet stream and its impact on the UK weather this "summer" has meant many fewer plein air painting trips. So Rob has devised a solution - painting in the car. Above you can see what a summer's day is tending to look like at the moment - and how Rob created a set-up for painting from the car. In the past, I've drawn from my car on a few occasions (eg during Mistral-like wind in France) but I've never ever painted from a car. Rob doesn't say in his post on his blog, Painting Wales Diary, whether or not the windscreen wipers were an essential part of the set-up kit or not! In the UK we are now officially experiencing the wettest summer on record. The Met Office issued a report last week about record-breaking rainfall figures. See more pictures and information here. The Met Office today can reveal the three months from May to July 2007 have broken records for this period, even before July is over. Provisional figures from the Met Office show that 387.6 mm of rain have already fallen across England and Wales, making it the wettest May to July since the England and Wales Precipitation record began in 1766. These figures will come as no surprise to many across England and Wales who have suffered flooding from the exceptionally heavy rainfall experienced in June and July. Have any other UK painters devised solutions for our 'wash-out' summer? I only realised this week that John Ward CBE, RP, NEAC died aged 89 on 14th June - planning an exhibition for his 90th birthday. This is what The Independent had to say in its obituary. John Ward was a painter and draughtsman of exceptional ability, whose work has an enduring appeal for anyone interested in the poetry of the everyday. He is perhaps best known as a portrait painter. The National Portrait Gallery holds 15 examples of his work, including a poignant watercolour of Walter de la Mare from 1956, and a beautiful and sensitive oil of the Princess Royal (1987-88). Between portraits he travelled and painted landscape and architecture in watercolour. Do read what John Doyle MBE PPRWS had to say about how he was taught to paint by John Ward in an equally informative obituary in The Guardian. John Ward's work emphasised drawing and he did quite a bit of work in pastel. I always really enjoyed seeing his work in a show and would always make a point of locating it early so I could also come back to it again at the end. In fact, I drew the wall on which his work hung at the recent exhibition of the Royal Society of Portrait Painters. 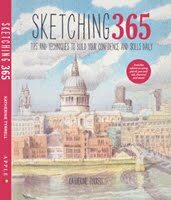 Martha has been in Washington and New York - check out her wonderful posts and sketches, which will all be listed shortly in the blogroll of my Travels with a Sketchbook blog. New York Sketchbook Part 1 features art deco designs in the Poiret: King of Fashion exhibition at the Metropolitan Museum (in its last week - it finishes 5th August). Martha's sketches are absolutely delightful. 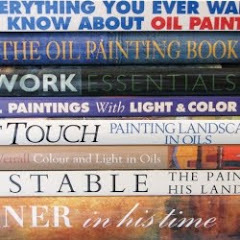 Ed Terpening (of Life Plein Air) shared his extended full spectrum oil colour palette - and some favourite mixes for plein air painting - a very informative and well illustrated post. Tracy Helgeson (of Works by Tracy Helgeson) recently commented on the drying times that she experiences while producing her wonderful colourist oil paintings on panels. I particularly liked Bands of Color, the painting featured in that particular post. I've writing some new text for my website recently. If you want your website or blog highlighted in browser searches, it helps to write text which incorporates keywords. I've found it very helpful to understand a bit more about the relative importance of different keywords associated with art and my particular interests. The following are some useful key word tools which I've been revisiting recently - plus one new one. The Keyword Selector - Overture Tool is the the one I've always used in the past when checking and editing the text for my website. It also helped me learn about keywords associated with my particular interests which helps with writing blog posts too. I sometimes look at the searches which people do before arriving at my site and they're virtually 100% relevant - which I regard as a major achievement! I use Google Alerts for particularly significant words or work combinations which I'm interested in. I've been very diligent about reading these after they alerted me to the major scraping of my blog by spam blohs which occurred earlier this year. It also helps me to know when somebody references my blog so I can go and say 'thank you'! Google Alerts are emails automatically sent to you when there are new Google results for your search terms. We currently offer alerts with results from News, Web, Blogs, and Groups. I discovered that the Google Adwords Keyword Tool had been moved to an external site. Ostensibly it's about writing text in relation to Adwords and therefore of no particular interest EXCEPT it's also very informative identifying volume in relation to key words relevant to your own websites and your own areas of interest. Use the "site related keywords" tab to check out key words associated with different URLs - check your website and blog! It can tell you about the keyword search volume for each keyword it finds and the level of competition from advertisers. with the keyword variations tab you can see whether any phrase associated with you (eg blog title)has any sort of search volume and what variations might be used. I'd love to hear from anybody who has any other useful tools for keyword analysis. Posted by Making A Mark on Sunday, July 29, 2007 8 comments Who's linking to this post? 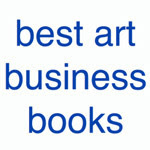 Categories art blogs, Art Galleries and Museums, art news, Art Process, art supplies, blogging, making a mark, oil, oil painting, painting, portraiture, tips and techniques, travels with a sketchbook, who's made a mark this week? 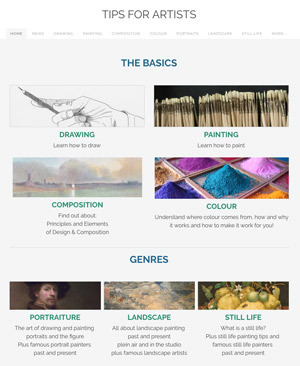 I discovered while googling the names of members of the Royal Watercolour Society that at least two of them (Annie Williams and Alison Musker) were featured in "Radio and the Artist" a Radio 4 website about how artists work with the radio on. Apparently the Bankside Gallery had an exhibition called "The Artist and Radio 4" in 2005. The BBC website lets you listen to Norman Ackroyd, Raymond Briggs, Kaffe Fassett, Zandra Rhodes and others explaining what radio means to them. Do you work to music, the radio or muse in peace? Posted by Making A Mark on Saturday, July 28, 2007 1 comments Who's linking to this post? Earlier in July, for my Flowers in Art month, I looked at some of the people who painted flowers in the past (see links at the end) and particular artists whose work has always interested me. Today is my first post about some more of today's contemporary artists who paint flowers and interest me and/or have influenced my own approach to art. Today it's the turn of three men - and I'll be posting about some more women who paint flowers tomorrow! I didn't realise until I started these blog posts about contemporary artists just how many of them work in watercolour or goache........which I'm sure says far more about me than the range of artists painting flowers today. However, I'm very happy to have suggestions (via the comments box) as to other contemporary painters of flowers who others have found stimulating. Joseph Raffael has a unique approach to the painting of flowers in watercolour. 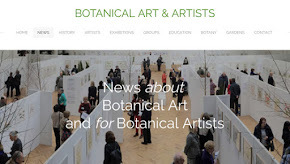 You can see his work on his website - I recommend the archives for a more full appreciation of his work with flowers - which are very large, complex, colourful and apparently both saturated and transparent at the same time. His processes are fascinating and are explained in the book about his work - Reflections of Nature - and also in his online autobiography here. If you want to see the work in progress progressions or watch the videos you need to have Quicktime installed. Raffael got his BFA from Yale School of Arts and studied colour and chromatic interactions with Josef Albers. It's maybe not so surprising that the use of colour is such a strong focus of his work. Charles Reid is a very popular watercolour artists and tutor who has written a number of very successful books for students of watercolour painting including Painting Flowers in Watercolour. His approach to watercolour is very fresh and spontaneous. I remember vividly the first time I saw a painting of his in a book which has drips! His subjects very much lean towards the 'found' school of composition. Which is not to say they are - he also has an excellent book on composition (Painting What You Want to See) - but they looks like they are! His website suggests that he's now rather more interested in landscapes and doesn't have too many paintings of flowers however this one - Pintail - provides an excellent indication of his style. You can find details of his workshops here. I first met Paul Riley on a painting holiday in Bali in 1992, learned a lot and had fun doing so and subsequently signed up for courses with Riley Arts at Coombe Farm in Devon where his studio and the family gallery are both based. I've watched him paint flowers in the studio and 'en plein air' in the past in an almost calligraphic approach. He tends to work on whole sheets, uses oriental brushes a lot and often completes his paintings very quickly - which is and will be a complete revelation to anybody who is hung up on detail using a sable brush with a small point! 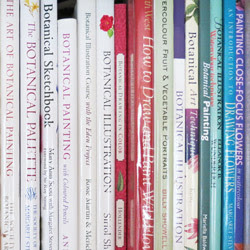 His books Flower Painting and Watercolour Workshop are great for all those who like a contemporary approach to watercolour and love their brushes and want to find out different ways of using them for the purposes of painting flowers. They provide excellent staged approaches to work in progress for those wanting to develop their skills. If you ever go on a course in the UK or abroad you'll find yourself mixing with students who keep coming back for more! So who's your favourite contempory male artist who draws or paints flowers? Posted by Making A Mark on Friday, July 27, 2007 3 comments Who's linking to this post? Pescheria means 'fish market' in Italian. This drawing is of the very famous Pescheria near the Rialto in Venice. Fish has been sold from this site for the last 600 years. It's a great favourite with artists because of its very large banner like red curtains which keep the market cool on a hot day. (You can see the fish if you click on this link to my travel sketchbook blog). I very much enjoyed doing the drawing after Whistler in my post on Whistler's Venice recently and wanted to do something similar - and add in one colour only - and this is the result. Chiaroscuro is the theme of the 85th Annual Exhibition of the Society of Graphic Fine Art at the Menier Gallery in Southwark 11-22nd September. This is one of my interpretations of 'chiaroscuro' which I'm submitting to the exhibition. chiaroscuro noun (chiaroscuros) 1 art the management of light and shade in a picture. 2 a monochrome painting. ETYMOLOGY: 17c: Italian, meaning 'light-dark'. However originally it had a much tighter definition and was a type of drawing on coloured paper which used white to define form. I thought it would be interesting to track down some of the other online sources of information. By which I mean I did this some time ago - but forgot to write a post about it at the time! So - on the right is what is regarded as a fine early example of chiaroscuro drawing - and below you will find some other definitions of chiaroscuro. Chiaroscuro drawing: A manner of drawing by which the usual drawing method of applying dark strokes over light colored paper is reversed. Instead, the composition is defined by light values, such as white gouache, over a dark ground. The etymology of the word is the combination of the two Italian words chiaro, meaning light, and scuro, the word for dark. (Unidentified German artist, 16th century, Martyrdom of St. Barbara, 1957.4). Without chiaroscuro, digital is just a bunch of squares, non-linear is non existent and HD might as well be DV. Now more than ever, chiaroscuro plays an important part in any production. Finally, yesterday this blog topped the 100,000 visits mark!!! I'd like to thank all the regular readers of this blog for making a very significant contribution to passing that threshold - and also to say "Hello" to all the visitors who found this blog on the front page of their browser search. I hope you'll be back! Posted by Making A Mark on Thursday, July 26, 2007 7 comments Who's linking to this post? Robert Genn recently wrote about the use of 'rent a wall' galleries and the Agora Gallery in New York in particular. He discussed the option of being hung in a standard gallery which takes work on consignment and has no up front fees as opposed to one in which you rent the wall space and/or do pay an up front fee - in galleries like the Agora. His Painters Keys site has the clickback which presents (1) his original letter and (2) readers responses. It makes interesting reading. Jackie Simmonds is one of those who commented. She highlighted one aspect of the nature of the financial equation between gallery and artist. I recently spoke to an artist who had a successful show. He told me he had sold approximately $100,000 worth of paintings. Terrific, I said, you must have filled the coffers a little. He laughed. He said that in fact, he earned less than 50% (because there is also VAT tax to pay here). Then, he had a massive framing bill. He had to pay a large sum towards the cost of the invitations. He had to offset the cost of the trips he took to gather reference material for the paintings. In the end, his net profit was in the region of about $25,000 - and it had taken him a year to paint those works. The gallery earned $50,000 FOR ONE WEEK'S WORK. Here's the other side of the fence and another (long run) perspective - an art dealer who sets out how a reputable and hard-working galleries invest their time and money. Thanks to Marion at painting.com for alerting me to The Logic behind the 50/50 split on Edward Winkelman's blog. It's a long read (and I recommend reading the comments as well) but it certainly sets down some markers for why a gallery might be justified in expecting the risk/reward equation to remunerate them in an adequate way. risk - dealer has to discount and/or dispose of all unsold stock at or above cost price or bear a loss. reward - all profits go to the dealer. very low margins on staple goods where competition exists; higher margins only where supply or competition is more limited. Profitability can also be influenced by the general state of the economy. Staple goods tend to have fewer fluctuations in demand compared to those which are only purchased when buyers are feeling 'well off'. Contrast the above with the situation for artists in relation to different kinds of art galleries. Galleries for rent: The sale between artist and buyer transacted with the aid of a third party providing wall space or acting as a representative - for an upfront fee. It can be very unclear where the gallery's real customer base actually lies. stock could be viewed as the number of artists on the books as it is their upfront fee which helps pay the rent! such galleries like artists who want an exhibition and are willing to pay. Logic suggests that a gallery will always want artists with a dedicated following to justify upfront investment in marketing and make a good contribution towards their overheads. Artists need galleries with good reputations to get in front of audiences who are used to investing in art. Profitable galleries can afford to 'take a punt' on new artists but will tend to cut their losses and limit their imvestment quickly if no sales emerge. So - is the situation black and white if you are an artist (or a gallery) - or are there lots of shades of grey? Do galleries really earn their commission - or is it far too high? In a commercial situation, who can afford to ignore what sells and where the real profit lies? Note "Dahlias #1": My drawing of Dahlias was done using the Blackadder technique of deciding where to place a flower on the page one at a time. I discovered that the best way of doing this was to have a dahlia stem inserted into a wine bottle which was placed just next to my drawing block of Arches HP and below - so that the flower was at about the same eye level as the drawing block. I could then twizzle it around to get different profiles. The interesting part then came in choosing placements and working out overlaps - and the fact that you can draw the same flower or bud from different angles. There is no particular focal point - it's just a pattern of lines in pen and ink which resolve into dahlia blooms and buds. Posted by Making A Mark on Wednesday, July 25, 2007 12 comments Who's linking to this post? William Morris (1834-1896) has had a significant influence on decorative art in the UK. His designs are based on natural forms - many of which are flowers. Of the nearly 600 designs which are attrubuted to him there are very few which do not feature flowers, leaves, trees or plants. Along with people like Charles Rennie Mackintosh, Morris was also one of the most prominent practitioners within the Arts and Crafts Movement an aesthetic movement that was prominent in the UK and USA between 1880 and 1910. He influenced a number of other important designers such as Charles F.A. Voysey (1857-1927). William Morris, as a writer, designer and socialist had a vast range of interests (see Wikipedia entry for a quick overview) but I'm interested in how William Morris developed his flower designs and this post will focus on that - and also include other interesting tidbits. The Victoria and Albert Museum. The V&A is an especially interesting place in relation to Morris. It now includes his work in its archives (eg wallpaper) but it also houses some of the works of art which Morris himself used to stimulate his own designs - such as the 'herbals', which contained descriptions and illustrations of herbs, flowers, fruit and other plants. The first pattern to be issued, in 1864, was 'Daisy', a simple design of naively drawn meadow flowers. The source was a wallhanging illustrated in a 15th-century version of Froissart's Chronicles', but similar flower forms can be seen in late medieval 'mille-fleurs' tapestries and in early printed herbals. These two designs, and the next pattern Fruit (also known as Pomegranate), share a medieval character that links Morris's early work in the decorative arts with the Pre-Raphaelite painters, and with Ruskin. However, they are also influenced by Morris's abiding interest in naturalism in ornament. Lecturing on pattern in 1881, he claimed, 'any decoration is futile ... when it does not remind you of something beyond itself'. His sources were plants themselves, observed in his gardens or on country walks, and also images of plants in 16th-century woodcuts (he owned copies of several 16th- and 17th-century herbals, including Gerard's famous Herball), illuminated manuscripts, tapes-tries and other textiles incorporating floral imagery. His designs were not to be literal transcriptions of natural forms but subtle stylised evocations. His designs were used for wallpapers, textiles, tiles, stained glass, ordinary glass ware - in other words all manner of things which were used in a decorative way and were produced or commissioned by his company, Morris and Company. Arthur Sanderson & Sons Ltd were first commissioned to produce wallpapers for Morris & Co. in 1930. This page of the William Morris website provides some fascinating archives of images relating to the applied use of flower designs done in pear wood blocks. He was much influenced by John Ruskin who was an observer of nature and an artist who enjoyed drawing flowers and who collected herbals. He emphasised in his book 'Elements of Drawing' the importance of close observation. He was also a member of a Pre-Raphaelite circle that included Dante Gabriel Rossetti and Edward Burne-Jones. Morris was also of the view that it was desirable to surround ourselves with decoration, lesser art not fine art, originating from natural sources rather than scientific representation. Morris collected and used herbals to suggest designs incorporating specific flowers or plants. Herbals were books about plants which contained illustrations which were woodcuts or engavings of high quality and were first printed around the sixteenth century. He also visited South Kensington Museum (now the V&A) to study designs from Turkey and Persia and the Islamic influences on flowers; incorporated wild tulips (a near eastern flower) into his garden at Kelmscott. (Note: At the time of writing Kelmscott Manor, former home of William Morris, is flooded due to the extensive rain and flooding in central and western England.). Given my own endeavours in this respect (see Plant Motifs and Art #2 at the V&A), I am persuaded that it's worthwhile to pursue this line of study some more. Of course you understand that it is impossible to imitate nature literally; the utmost realism of the most realistic painter falls a long way short of it. Morris himself summarised the key qualities for a designer when he said you must fully understand nature and study it closely, know your history and then develop and use your imagination. Kennet indigo-discharge printed textile designed by William Morris. Ornamental pattern work...must contain three qualities: beauty, imagination and order. Above all, avoid vagueness...definite form bounded by firm outline is a necessity for all ornament...do not be afraid of your design or try to muddle it up so that people can scarcely see it; it if it is arranged on good lines and its details are beautiful you need not fear it looking hard so long as it covers the ground wel and is not wrong in colour. He liked to develop medievalism within his gardens - first at The Red House and then at Kelmscott Manor both in terms of design and the plants. This post has barely scraped the surface of the wealth of information that exists about William Morris - so do explore the links if you'd like to know more. Note (and an aside): Jane Morris, William Morris's wife, is the model for Dante Gabriel Rossetti's painting Proserpine 1877 (Tate Gallery). This is a photograph of her posed by Rossetti from the William Morris Gallery. It's one of the earliest examples of pre-raphelite photography. Posted by Making A Mark on Tuesday, July 24, 2007 2 comments Who's linking to this post? 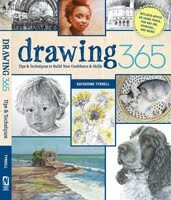 This post is a summary of a number of tips and techniques for working from life when drawing or painting flowers. It's partially derived from a thread that I started a while back in the Artwork from Life Forum on Wet Canvas called Flowers: Tips and Techniques for working from life. This post is a distillation of the tips offered in that thread - with links back to the blogs or websites of those people who contributed to the thread. I must give a special mention for Chuck Law and his very generous sharing of his specialist knowledge. Besides my own contributions to the thread, I've also added in a few more thoughts at the end. Find places which discard their flowers on a periodic basis. These will usually include blooms which are suitable for artwork. More professional advice by Chuck from Tips on Flower Selection, Care and Arranging. Care: For a good long life when using flowers as a still life, cut them and place into fresh warm water immediately......The longer they stay out of water, the more likely it is they won't be able to revive.......When you get home cut at least an inch off the stem with a good sharp knife or scissors and place immediately into warm water. Be sure to first remove any leaves from the part of the stem that will be in the water. Let them drink for an hour or so...Then arrange them, recutting as you place each blossom into the vase. All this insures a steady flow of water to the flower head and a longer life....When there are signs of wilting or other problems a simple recut may save the day! More from Chuck (Chuck Law - Chuck Law's Art Pages blog) in Tips on Flower Sselection, Care and Arranging. review how your light moves around the rooms. If you want continuous sunlight you need to find the place where it lasts longest. So that's my draining board in the morning (or the kitchen floor!) and my dining table in the late afternoon/early evening. You can move in props to dress the for background as required - although I have learned to mentally make backgrounds "disappear" when they're not helpful to the painting. Just because you're working from life does not mean that the taps have to be included - you can edit indoors as well as out of doors! light, whether artificial or natural, falling on a wall close by will provide a shadow - which will tend to have a hard edge if close. Try moving flowers further away from where they are throwing shadows and you may get a softer edge. Also, check out the recent thread on how to create a lightbox. Poppies always tend to grow on freshly disturbed soil - they're very common near construction sites. Don't expect wild red poppies to last long once cut. The probably have a maximum life of around 12 hours before they start to wilt. Cut and draw them fast or better still draw them in situ! Try sowing your very own wild flower meadow. There are a number of suppliers of wild flower seeds or you could try collecting your own. A number of gardens and public parks are also doing the same thing. For advice or inspiration, check out The Royal Horticultural Society's advice page on establishing a wild flower meadow or the Prince of Wales's garden at High Grove which was one of the first to do this in recent times. Note that there is a 3 year waiting list to tour the garden! Finally don't forget the opportunities presented by flowers in pots. Not all drawings or paintings need to be of cut flowers. Pot plants can eliminate many of the potential problems experienced with cut flowers - and rearranging them can be rather easier! If you've got a tip not mentioned above please don't hesitate to add it using the comments function. Similarly, if you know of any good websites with advice about selecting, arranging and caring for flowers used in artwork. For those interested in owning one of my images, I am offering a fine art print of "Plumbago and Daisies" (see top) on Imagekind. Posted by Making A Mark on Monday, July 23, 2007 12 comments Who's linking to this post? 22nd July 2007: Who's made a mark this week? "Making A Mark" sets up a gallery at Imagekind! 15th July: Who's made a mark this week? 8th July 2007: Who's made a mark this week?